Ground was broken in October to begin construction of the Paulsboro Marine Terminal at the Port of Paulsboro. South Jersey Port Corporation advances plans to construct the new Pauls­boro Marine Terminal. The Port of Camden handles more than 3 million tons of cargo for the year, breaking previous records set in each of the previous three years. SJPC authorized $135 million in bonds for the development of Paulsboro Marine Terminal at the Port of Paulsboro. 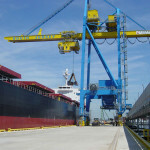 SJPC issued major economic development program through a bond issue that funded the construction of Pier 1A and the purchase of heavy lift Kocks crane (Holcim).